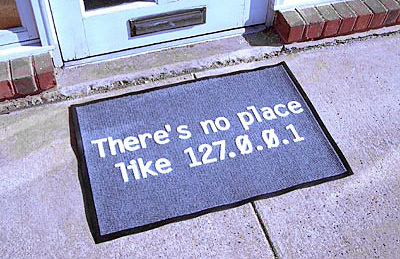 There's No Place Like "Home" Door Or Floor Mat | OhGizmo! By Andrew Liszewski on 04/10/07 • Leave a comment! While by no means a new edition to the ThinkGeek catalogue this clever floor mat will still leave any visitors either scratching their heads or cowering at your awesome level of l33tness. Though when I think about it the type of person who would understand this joke probably never leaves their own home or apartment (myself included) so odds are you’ll be spending the majority of your time explaining to the mailman or delivery guy the concept of an IP address. You can spruce up your own home with the 127.0.0.1 mat from ThinkGeek for $39.99.